Market review, debt crises & asset confiscation? Since our last article, some major events took place. For Europe and Russia, the most important event might have been the shooting down of airplane MH17 over the territory of Ukraine. Although cause and guilt are in investigation, Western media and politicians quickly decided that Russia is to blame. In the aftermath of the event tighter sanctions were introduced. The Russian ruble depreciated significantly, while the European and Russian stock market fell. The EuroStoxx50 dropped around 10% from peak to its lowest point since the beginning of August, before recovering quickly back close to its heights. This recovery was mainly due to new stimulus by the ECB and a surprising further rate cut. The European economy itself does not reflect this recovery, also due to sanctions hitting some European businesses. Usually when there is a loser there must also be a winner, especially in global financial markets where money is seeking safer investments. The main winner has been the US Dollar, which is widely seen as a safe haven. 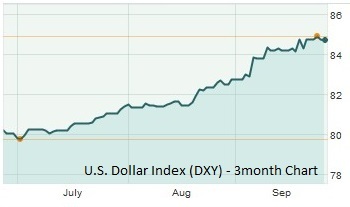 Over the course of the last 3 month, the US Dollar Index (DXY) increased from 80 to 85. This index reflects the value of the USD to a basket of other major currencies. Other currencies, such as the Russian Ruble depreciated even more drastically against the US Dollar. Over the last three month, the Ruble has depreciated around 12% against the US dollar. This is good for investors holding US Dollars willing to invest in Russia or living in Russia, but bad for Russians looking to invest or travel abroad. Financial markets are not a one way street; we think this is just a short-term movement of the U.S. Dollar. Considering sanctions against Russia, many emerging markets are turning away from the USD, with the most significant step being discussions about the establishment of the New Development Bank (BRICS development bank), as a counterweight to the EU/US lead World Bank and IMF. This may weaken the power of the US in geopolitics over time. Another very important factor is agreement between some nations to get rid of the U.S. Dollar as a settlement currency for trade, especially in commodities. In the end, this could become the death of the petro dollar. 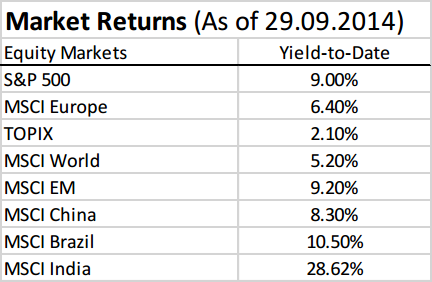 Overall, one can see that the US market (S&P500) performed better than the European market. This is a change since our last report when the MSCI Europe was performing better than the S&P500. The latest underperformance of the MSCI Europe could be credited to sanctions and rising tensions over Ukraine. Recently, important agreements between the conflicting parties were reached. We look forward to reduced tensions and are hopeful for a de-escalation of sanctions. 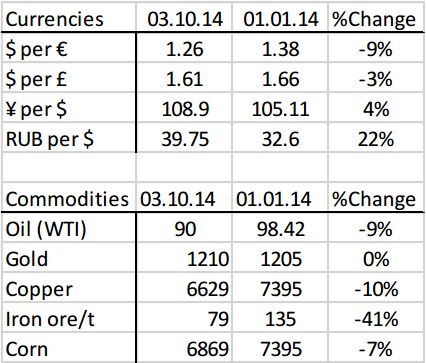 Major commodities remain weak, with iron ore being the worst performer since the start of 2014, losing 41% in value. The oil price dropped significantly over the last three month, which could be an indicator for a slowing global economy. Currently one can observe the huge amount of money flowing out of emerging markets, back into the US Dollar. In the week from 15th to 19th of September alone, $1.4 billion were withdrawn from emerging markets exchange traded products. 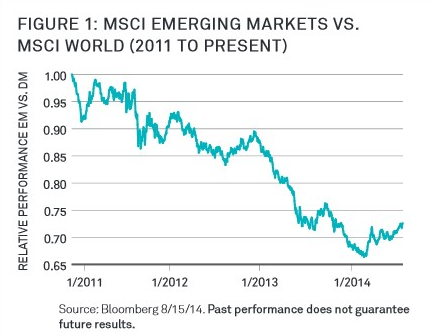 Our expectations are that over the short run the volatility in emerging markets might remain but in the longer run, emerging markets will outperform developed markets due to low valuations, relatively strong economic growth and positive government reforms. 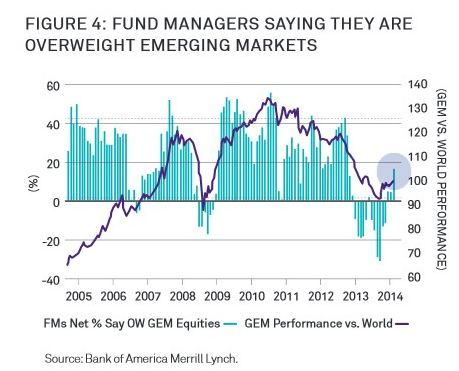 The figures above, taken from a recent BlackRock report, show that emerging markets relative performance is lagging behind Developed Markets and that fund managers reduced exposure to emerging markets significantly since the beginning of 2011. Lately, this seems to have reversed. Nonetheless, risks remain and with the US Federal Reserve and Bank of England announcing to increase interest rates in 2015, emerging markets could get under pressure as cheap money from developed countries might pull out. We already witnessed this before, but it could be a temporary movement with emerging markets recovering soon after, especially Brazil and India. Another worrying factor is the debt load in China and its real estate market. Currently it looks stable but the problem still exists. Brazil is slipping into recession again, which makes it less attractive but some companies offer great value. India is the bet of the next decade as the new president is opening the country for foreign investments and wants to unify the tax regimes of various Indian states. This should boost the economy, especially benefiting smaller companies that were before unable to do business across state borders due to high bureaucratic burdens and costs. 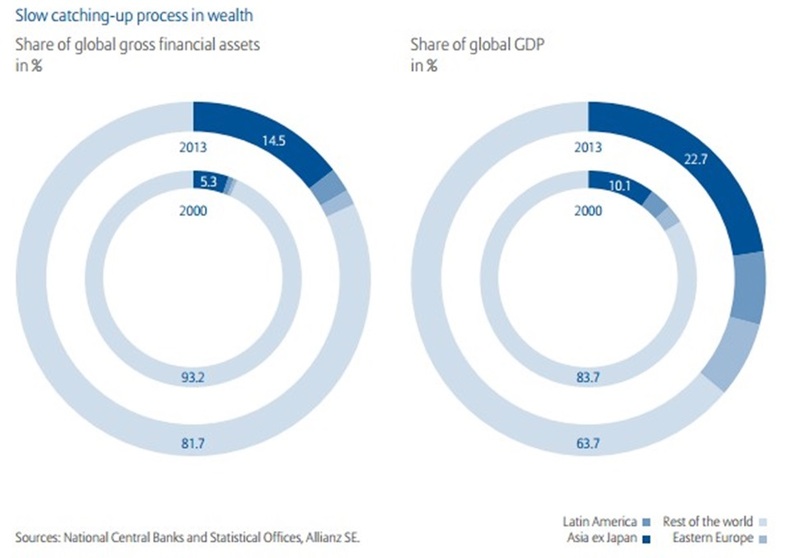 Another factor, highlighted in the Allianz Wealth Report 2014, is the “power shift” between developed and emerging countries. One can see in the graphic below that from 2000 to 2013 the global financial assets owned by Asia ex Japan, Eastern Europe and Latin America increased significantly. In addition, the share of global GDP is shifting rapidly towards emerging markets. This will probably continue and maybe increase in speed as long as Western economies, especially in Europe, will not come back on track. The Allianz report states that China alone was accountable for 31% of global economic growth. With higher wealth accumulation in emerging countries this should lift corresponding equity markets, as people will seek to invest. In the short-term markets will be mainly driven by Western central bank policies and cheap money supply. 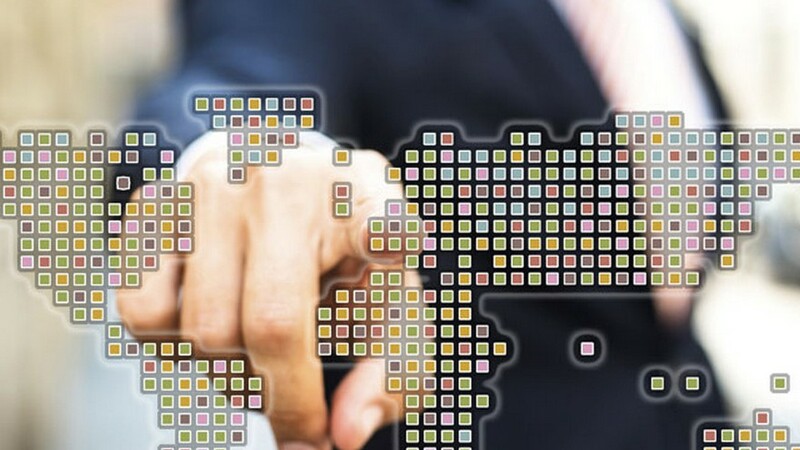 Thinking out of the box and with a longer time horizon, the earlier mentioned figures and developments point out an increasing importance of emerging markets, with corresponding wealth accumulation and rising stock markets. Taking into account current world politics one can see that Western leaders understand the threat to “Western primacy”. However, problems in Europe and the US are homegrown. The desire of emerging markets for self-determination will lead to a stronger stance, where the establishment of the “New Development Bank” (BRICS Bank) will only be the first step. Our opinion to prefer equities over bonds, especially Western sovereign bonds did not change since publishing our last article. During the last month and the whole year 2014 we saw a rally in money market funds, especially Southern European government debt, e.g. Spain and Italy. 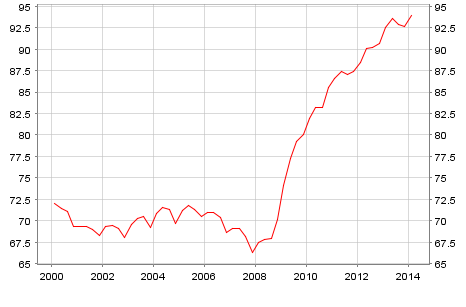 This is mainly due to cheap money and the “whatever it takes” mentality of ECB head Mario Draghi. Latest statements support the fact that the ECB will keep on going with buying government bonds, but will also start to buy less qualitative securities, especially Asset Backed Securities (ABS). This will probably lead to some gains in the high yield bond sector and other high-risk credit instruments. We do not think this is sustainable. A look at the graph below shows that since the crisis of 2008 the drastic increase in th Debt-to-GDP ratio in the Eurozone, although fiscal tightening was implemented in some European countries. Fiscal tightening did not improve the economic situation. We expect that soon the ECB and countries like Italy and Spain will become more expansionary, pumping liquidity into the economy via private banks. Another remarkable factor are the yields of peripheral Euro zone government bonds (such as Spain) are lower than for US government bonds. Essentially, the US government can print US Dollars, whereas the Spanish government cannot print Euros. We see signs of a clear discrepancy and overvaluation of Euro-peripheral bonds. The US faces a slightly different situation as a highly indebted country with no default probability. The US is able to print endless US Dollars to repay debt. 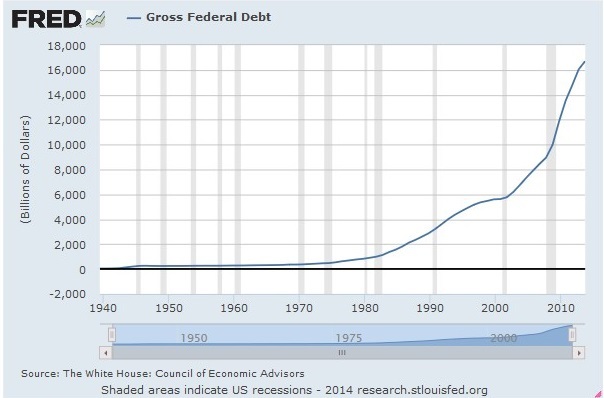 The next graph shows the development of US National Debt from 1939 to 2013. On 26th of September 2014 the national debt clock shows US$17,775,000,000, or almost 18 trillion US Dollars. A frequently raised question is how will Western countries ever be able to repay this massive debt? Different ways can be used, either through economic growth that leads to an increase in government revenues, especially taxes. Higher inflation would be a possibility to devalue the debt. Haircuts like those that we have seen in Cyprus could be a solution or, maybe the most drastic way, a confiscation of wealth. Most likely, a mixture of these solutions will be used. Investors can prepare for every eventual outcome. We recommend not relying on government pensions or pooled pension plans that invest in government bonds. Especially in Germany and other European countries, group pension plans play a major role for retirement planning. These mostly invest in government bonds, which currently do not offer sufficient return to cover obligations and we are likely to see either bankruptcies or a reduction in obligations, possibly leaving the investor with less money than expected. In the worst case scenario, the investor will receive back far less than contributed over their life. We see diversification as a way to safeguard retirement, especially investing in equities. This is also a good way to protect against inflation. What we have also seen recently is haircuts on government bonds, like in Greece and Cyprus, hitting investors, or a tax on deposits in Spain. We see this as a trial run for bigger action in case we run into another severe financial crisis. As mentioned in earlier articles, the IMF is also on board, discussing a wealth tax to bring down sovereign debt to a sustainable level. Another possibility could be asset confiscation. Although a full asset confiscation is unlikely, challenging times will demand challenging answers, or as Jean-Claude Juncker, head of the Eurogroup, did put it: “When it becomes serious, you have to lie”. A good example is the recent asset freeze and curfew order for the owner of holding company “Sistema” Mr. Vladimir Yevtuschenkov. Rumors spread that its real aims is to seize the oil company Bashneft. To legally protect yourself from government arbitrariness should be a matter of priority for every individual investor. Regarding previous statements, one can see the way that governments may try to “refinance” debt however possible. These measures are a threat to everybody who has acquired wealth. Many of the wealthiest people are already parking their money in foundations or trusts in secure international jurisdictions. Assets held in such structures are very difficult hard for local governments to confiscate. There are ways to secure and build up a secure amount of wealth. Shoreline offers the possibility to save and invest money in a various international jurisdictions and tax efficient structures offering the highest degrees of protection. We recently launched a new product, an S&P500 Index Tracker savings plan. It is designed for regular monthly savings, investing directly in the broad S&P500 index. The product is underwritten by major international banks (HSBC, Deutsche Bank, Morgan Stanley, Citibank). This offers exposure to an excellent equity market index, with 100% capital protection.